The Perfect Place to Enjoy the Best of Himi! An Incredible Collection of 33 Restaurants and Souvenir Shops! Enjoy conveyor belt sushi made with seafood straight from Himi Port, or other local specialties like Himi udon noodles, Himi beef, Himi curry, and plenty of other delicious dishes you can only enjoy in Himi. 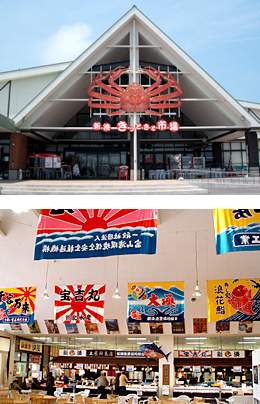 You can also find plenty of great seafood items like fresh seafood caught nearby, as well as prepared seafood items, at a variety of shops offering Toyama Bay seafood. 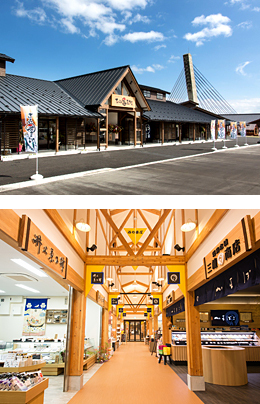 Himi Banyagai also features a great selection of souvenir shops offering items like character merchandise, delicious foods, and more — or you can simply relax and enjoy the sea breeze and the harbor market atmosphere, as a lovely way to experience Himi. Magnificent Views of the Sea of Japan, the Kaiwomaru, and the Tateyama Mountains, alongside Local Specialties like Japanese Glass Shrimp, Red Snow Crab, and More Outstanding Seasonal Seafood! Shinminato Kittokito Market at Shinminato Fisherman’s Wharf is a great place to enjoy fantastic seafood brought ashore at Shinminato Fishing Port, like Japanese glass shrimp — the “jewels of Toyama Bay” — red snow crab, firefly squid, yellowtail, snow crab, Japanese ivory shell, and much more. Kittokito-tei, the restaurant here, offers delicious dishes made with seafood caught the same morning. The market also offers a great variety of souvenirs made with the finest ingredients from both land and sea. By Train: • From JR Takaoka Station, take the Manyosen tram to Higashi Shinminato Station (40 min. ), then walk 10 min. 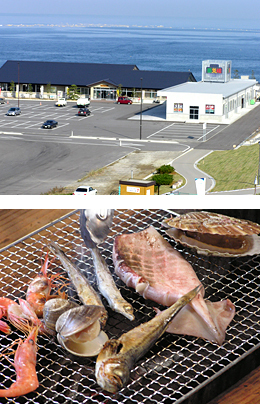 Seaside Station Shinkiro is a great destination to try the delicious foods of Uozu. Enjoy freshly caught seasonal seafood from Uozu Port, or pick up seasonal produce, famous local snacks and sweets, local folk crafts, and more from Jantokoi-ichi. There are also restaurants, including Gengenbo, which is run by the Uozu Fisheries Cooperative. The event space hosts flea markets, and morning markets twice a month (2nd and 4th Sunday of each month), and every weekend, there’s hama-yaki seaside seafood grilling! Relax and enjoy fresh seafood with a magnificent view of Toyama Bay — and if you’re lucky, you might even see a mirage over the water! Enjoy Delicious Food from Kurobe and Refreshing Sea Breezes! The perfect place for seafood lovers to get their fill of outstanding seafood from Kurobe! Featuring two buildings: at Toretate-kan, visitors can buy fresh seafood from the fishing port or prepared seafood products and local specialties, which make great souvenirs. Dekitate-kan offers restaurants where visitors can grill seafood on their own, or enjoy sushi or traditional seaside dishes. The terrace is a great place to relax, too, with magnificent views of the Sea of Japan and a refreshing cool foot bath. 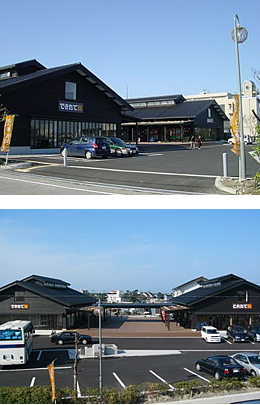 Ikuji Fish Station makes a great destination to try the best seasonal seafood from Toyama Bay and Kurobe Port! Copyright(c) Umasa Ichiban Toyama Seafood Campaign Office All Rights Reserved.